Thunderstruck NPR coverage of Thunderstruck by Erik Larson. News, author interviews, critics' picks and more. A vivid portrait of the Edwardian era recounts two parallel stories—the case of Dr. Hawley Crippen, who murdered his wife and fled the country with his mistress to build a new life in America, and Guglielmo Marconi, the inventor of wireless communication—as the new technology is used to capture a killer. 300,000 first printing. 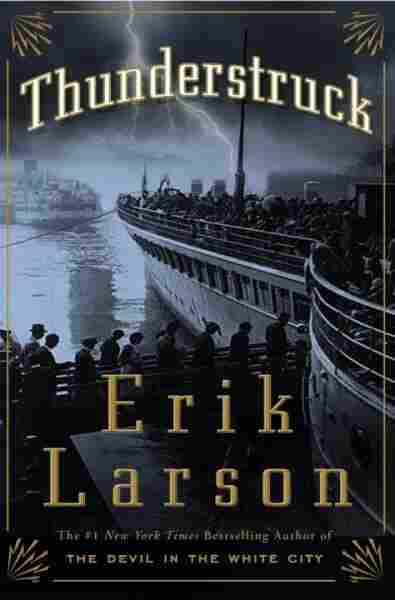 October 20, 2006  Erik Larson's books weave together multiple plots based on actual events. Thunderstruck is the tale of a mild-mannered doctor who murdered his wife, a trans-Atlantic chase, and the inventor who created the wireless telegraph. In the ardently held view of one camp, the story had its rightful beginning on the night of June 4, 1894, at 21 Albemarle Street, London, the address of the Royal Institution. Though one of Britain’s most august scientific bodies, it occupied a building of modest proportion, only three floors. The false columns affixed to its facade were an afterthought, meant to impart a little grandeur. It housed a lecture hall, a laboratory, living quarters, and a bar where members could gather to discuss the latest scientific advances. Inside the hall, a physicist of great renown readied himself to deliver the evening’s presentation. He hoped to startle his audience, certainly, but otherwise he had no inkling that this lecture would prove the most important of his life and a source of conflict for decades to come. His name was Oliver Lodge, and really the outcome was his own fault— another manifestation of what even he acknowledged to be a fundamental flaw in how he approached his work. In the moments remaining before his talk, he made one last check of an array of electrical apparatus positioned on a demonstration table, some of it familiar, most unlike anything seen before in this hall. Outside on Albemarle Street the police confronted their usual traffic problem. Scores of carriages crowded the street and gave it the look of a great black seam of coal. While the air in the surrounding neighborhood of Mayfair was scented with lime and the rich cloying sweetness of hothouse flowers, here the street stank of urine and manure, despite the efforts of the young, red-shirted “street orderlies” who moved among the horses collecting ill-timed deposits. Officers of the Metropolitan Police directed drivers to be quick about exiting the street once their passengers had departed. The men wore black, the women gowns. Established in 1799 for the “diffusion of knowledge, and facilitating the general introduction of useful mechanical improvements,” the Royal Institution had been the scene of great discoveries. Within its laboratories Humphry Davy had found sodium and potassium and devised the miner’s safety lamp, and Michael Faraday discovered electromagnetic induction, the phenomenon whereby electricity running through one circuit induces a current in another. The institution’s lectures, the “Friday Evening Discourses,” became so popular, the traffic outside so chaotic, that London officials were forced to turn Albemarle into London’s first one-way street. Lodge was a professor of physics at the new University College of Liverpool, where his laboratory was housed in a space that once had been the padded cell of a lunatic asylum. At first glance he seemed the embodiment of established British science. He wore a heavy beard misted with gray, and his head—“the great head,” as a friend put it—was eggshell bald to a point just above his ears, where his hair swept back into a tangle of curls. He stood six feet three inches tall and weighed about 210 pounds. A young woman once reported that the experience of dancing with Lodge had been akin to dancing with the dome of St. Paul’s Cathedral. To the dismay of peers, one of his greatest distractions was the world of the supernatural. He was a member of the Society for Psychical Research, established in 1882 by a group of level-headed souls, mostly scientists and philosophers, to bring scientific scrutiny to ghosts, séances, telepathy, and other paranormal events, or as the society stated in each issue of its Journal, “to examine without prejudice or prepossession and in a scientific spirit, those faculties of man, real or supposed, which appear to be inexplicable on any generally recognized hypothesis.” The society’s constitution stated that membership did not imply belief in “physical forces other than those recognized by Physical Science.” That the SPR had a Committee on Haunted Houses deterred no one. Its membership expanded quickly to include sixty university dons and some of the brightest lights of the era, among them John Ruskin, H. G. Wells, William E. Gladstone, Samuel Clemens (better known as Mark Twain), and the Rev. C. L. Dodgson (with the equally prominent pen name Lewis Carroll). The roster also listed Arthur Balfour, a future prime minister of England, and William James, a pioneer in psychology, who by the summer of 1894 had been named the society’s president. It was Lodge’s inquisitiveness, not a belief in ghosts, that first drove him to become a member of the SPR. The occult was for him just one more invisible realm worthy of exploration, the outermost province of the emerging science of psychology. The unveiling during Lodge’s life of so many hitherto unimagined physical phenomena, among them Heinrich Hertz’s discovery of electromagnetic waves, suggested to him that the world of the mind must harbor secrets of its own. The fact that waves could travel through the ether seemed to confirm the existence of another plane of reality. If one could send electromagnetic waves through the ether, was it such an outrageous next step to suppose that the spiritual essence of human beings, an electromagnetic soul, might also exist within the ether and thus explain the hauntings and spirit rappings that had become such a fixture of common legend? Reports of ghosts inhabiting country houses, poltergeists rattling abbeys, spirits knocking on tables during séances—all these in the eyes of Lodge and fellow members of the society seemed as worthy of dispassionate analysis as the invisible travels of an electromagnetic wave. Partly because of his diverse interests and his delight in new discoveries, by June 1894 he had become one of the Royal Institution’s most popular speakers. The evening’s lecture was entitled “The Work of Hertz.” Heinrich Hertz had died earlier in the year, and the institution invited Lodge to talk about his experiments, a task to which Lodge readily assented. Lodge had a deep respect for Hertz; he also believed that if not for his own fatal propensity for distraction, he might have beaten Hertz to the history books. In his memoir, Lodge stopped just short of claiming that he himself not Hertz, was first to prove the existence of electromagnetic waves. And indeed Lodge had come close, but instead of pursuing certain tantalizing findings, he had dropped the work and buried his results in a quotidian paper on lightning conductors. Every seat in the lecture hall was filled. Lodge spoke for a few moments, then began his demonstration. He set off a spark. The gun- shot crack jolted the audience to full attention. Still more startling was the fact that this spark caused a reaction—a flash of light—in a distant, unattached electrical apparatus. The central component of this apparatus was a device Lodge had designed, which he called a “coherer,” a tube filled with minute metal filings, and which he had inserted into a conventional electric circuit. Initially the filings had no power to conduct electricity, but when Lodge generated the spark and thus launched electromag- netic waves into the hall, the filings suddenly became conductors—they “cohered”—and allowed current to flow. By tapping the tube with his finger, Lodge returned the filings to their nonconductive state, and the circuit went dead. Though seemingly a simple thing, in fact the audience had never seen anything like it: Lodge had harnessed invisible energy, Hertz’s waves, to cause a reaction in a remote device, without intervening wires. The applause came like thunder. But Lodge did not take Lord Rayleigh’s advice. Instead, once again exhibiting his inability to pursue one theme of research to conclusion, he left for a vacation in Europe that included a scientific foray into a very different realm. He traveled to the Ile Roubaud, a small island in the Mediterranean Sea off the coast of France, where soon very strange things began to happen and he found himself distracted anew, at what would prove to be a critical moment in his career and in the history of science. For even as Lodge conducted his new explorations on the Ile Roubaud, far to the south someone else was hard at work—ingeniously, energetically, compulsively—exploring the powers of the invisible world, with the same tools Lodge had used for his demonstration at the Royal Institution, much to Lodge’s eventual consternation and regret. It was not precisely a vision, like some sighting of the Madonna in a tree trunk, but rather a certainty, a declarative sentence that entered his brain. Unlike other lightning-strike ideas, this one did not fade and blur but retained its surety and concrete quality. Later Marconi would say there was a divine aspect to it, as though he had been chosen over all others to receive the idea. At first it perplexed him—the question, why him, why not Oliver Lodge, or for that matter Thomas Edison? The idea arrived in the most prosaic of ways. In that summer of 1894, when he was twenty years old, his parents resolved to escape the extraordinary heat that had settled over Europe by moving to higher and cooler ground. They fled Bologna for the town of Biella in the Italian Alps, just below the Santuario di Oropa, a complex of sacred buildings devoted to the legend of the Black Madonna. During the family’s stay, he happened to acquire a copy of a journal called Il Nuovo Cimento, in which he read an obituary of Heinrich Hertz written by Augusto Righi, a neighbor and a physics professor at the University of Bologna. Something in the article produced the intellectual equivalent of a spark and in that moment caused his thoughts to realign, like the filings in a Lodge coherer. What he hoped to do—expected to do—was to send messages over long distances through the air using Hertz’s invisible waves. Nothing in the laws of physics as then understood even hinted that such a feat might be possible. Quite the opposite. To the rest of the scientific world what he now proposed was the stuff of magic shows and séances, a kind of electric telepathy. His great advantage, as it happens, was his ignorance—and his mother’s aversion to priests.